High Season for Fishing officially is well under way and the machine is ready to start churning out Monster Yellowfin Tuna over 200 lbs at our world famous fishing grounds of Corbeteña and El Banco! Black Marlin upwards of 600 lbs will be common place this month and carry over into September. With the warm waters of summer bait moves into the bay and the general area. With this bait comes what fisherman fantasize about, a finned fantasy or bucket list fish, definitely a once in a lifetime experience. . Don’t forget Dorado in the 65 lb range or Sailfish in the 70 lb plus range. Yes folks, Puerto Vallarta has it all when it comes to fishing. With the bad economy and rising fuel prices few are heading out. If you are here in August, you can now have these fishing grounds almost to yourself. Now this condition will continue which means you will have most of the fish all to yourself. Nobody cutting lines or snaking your fish. You can feel like Hemmingway in the 40´s if you´re a mind to. Inside the bay we have the trash line. Smaller Dorado will feed on the trash line created by organic materials our species just love. Snappers, Needle fish, Bonito, Skip Jack Tuna, and even Yellowfin Tuna are in the bay. You can have all these species in a four hour trip to Yelapa and back. For younger enthusiast smaller fish are a welcome experience. 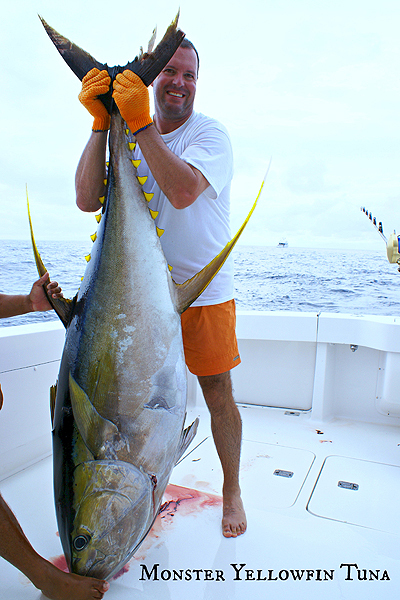 For the adult, no worries, the Yellowfin Football Tuna will be running 40 lbs and they´re arm breakers! From this point forward, our fishing grounds can and will produce record breaking sizes. Now somebody is going to catch them, why not have it bee you?